Whitley's Peanut Factory's management respects the privacy of our customers. When you shop with us via the website, phone or mail our top priority is to protect your customer information. Your information, when sent via the website, is sent through a secure session established with Secure Socket Layer (SSL). This technology which is an industry standard encryption format, scrambles your account information before it is sent to us making it virtually impossible for anyone other than Whitley's to read it. We do this to serve you effectively and efficiently without exposing you to risks concerning unauthorized access to order transaction information. When the customer request a catalog or place an order, we collect information so we may process the transaction efficiently. On an order, we provide you with a confirmation of that order via e-mail. The information we collect may also be used by us to contact you for marketing purposes. The Whitley's catalog is mailed several times throughout the year and e-mail campaigns are sent monthly to customers who give us their e-mail address. If you supply us with your telephone number online or via phone, you will only receive telephone contact from us regarding orders you have already placed with our company. If you do not wish to receive e-mail campaigns or other important information about Whitley's products; you can make that change from the last e-mail sent or email us at customercare@whitleyspeanut.com. To update or change your personal information call us at 800-470-2244 or e-mail us at customercare@whitleyspeanut.com. Whitley's Peanut Factory uses all features of Google Analytics, including obtaining specific visitor cookie data, such as the source, medium and keyword used to visit our website. Google Analytics does not store any visitor specific data and we will not use visitor specific data in any way related to Google Analytics, Google Adwords, and Remarketing. Whitley's Peanut Factory uses remarketing with Google Adwords and analytics to display content specific advertisements to visitors that have previously visited our site when those visitors go to other websites that have the Google Display Network implemented. Other third-party vendors, including Google, use first-party cookies (such as the Google Analytics cookie) and third-party cookies (such as the DoubleClick cookie) together to inform, optimize, and serve ads based on visitor’s past visits to our website. We take our users’ privacy very seriously, and feel that certain personal information should always be kept private, so we’ve developed restrictions around the types of ads where we don’t allow remarketing. When creating remarketing lists, we do not collect or use any sensitive information about users, including financial status, sexual orientation, and other sensitive categories. You may Opt Out of Google Advertising at any time by clicking here. If you have any questions regarding Whitley's Privacy/Security Policy, you can e-mail us through customercare@whitleyspeanut.com. Please be sure to include your e-mail address so we can respond to your question. If you prefer, call 800-470-2244, and a customer service representative will help. Or, write us at Whitley's Peanut Factory, P.O. Box 647 Hayes, VA 23072. Attn: Webmaster. 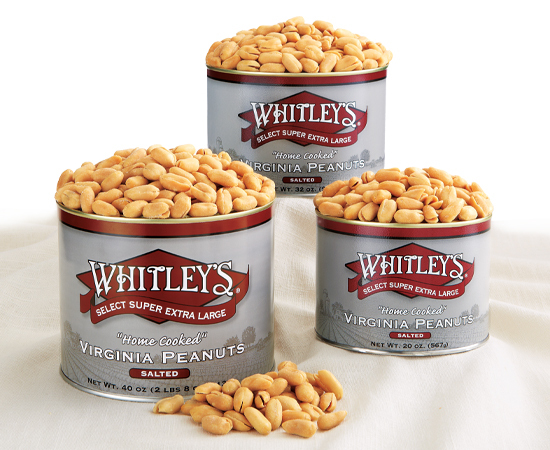 * Whitley's Peanut Factory reserves the right to update, modify or change the above policy at its discretion.